i am demonstrably not one to pay too much heed to numbers. this can be very much to my detriment, i will admit, but illustrations, photographs and words are so much less harsh that i prefer to inhabit their world rather than the inscrutable world of digits. the confusing part of this, to me at least, is why i had not a corresponding soft spot for algebra when at school. surely line upon line of letters representing those cunning little numbers would have acted as palliative, an alias if you will, allowing the manipulation of the concrete with the hypothetical. unfortunately, that was not the case; how many of you have needed to employ any algebraic notation when deciding whether to buy the red jersey or the blue jersey? i may castigate or ignore numbers till the sheep in the field go to sleep at night, but somehow their imposing definition has practical and often salutory uses. of course, i decry a subject that was simply unfairly introduced; not one mathematics teacher at school ever related the notion of algebra to the real world that impinged the minute we set foot outside the classroom door. its saving graces only came to light many years later when, for reasons still unclear, i decided to occupy one evening per week studying computer programming. this was (and still is) at a remarkably rudimentary level, instructing an apple ii to add 2 + 4 and hopefully engender the correct answer. any of you with perhaps a higher level acquaintance with the innards of microchips and circuit boards will see where this is heading. for in order to allow the computer to add any numbers without continually having to re-write the programme, it was necessary to write the instructions as a + b = c, then have the computer ask the user to input a, then input b. in this manner, any numbers could be used. my first, low-level experience of algebra at work in the real world. sadly, this euphoric experience has not necessarily stood me in good stead when it comes to fitting a new cycle computer to a bicycle. granted, those of far greater experience than i have already figured out the code required to display the correct digits on that small liquid crystal display, but it is still up to the incompetent to let the computer know which of those digits it is that one would like to peruse. as the saying goes 'if all else fails, read the f***ing manual'. complex computers, however, tend to have complex manuals; perhaps i should modify that statement: manuals that look complicated. it could be that the nomenclature surrounding the acronymical naming of bbb employs a hideous subterfuge, but the official explanation has it that the three bs represent bikeparts for bikers by bikers, and if true, then i find that highly commendable, for the company is dutch and i had expected something all but unpronounceable. the packaging encompassing bbb's microboard computer is compact and bijou, opening up like a book to reveal the computer at sleep. all the gubbins are inside the box in several poly packs, and that's where the worry begins. how many bits and bobs does one need to affix a computer to a bike? fortunately, that's a kneejerk reaction, for several of the zip-ties and mini bungee cords are there to facilitate fixing to bicycles of differing fork and handlebar size and thus not all are required at once. thankfully, like most of the current offerings, the computer is wireless; oh how i hated winding the connecting wire round the front brake cable. the bit that stares you in the face displaying numbers that are all too depressing (even the clock; how could it have taken that long?) can be fitted to the handlebar or, as in this case, the stem. both can be easily accommodated using one or other shaped adaptor, as can the method of fixing; either zip-tie or bungee. 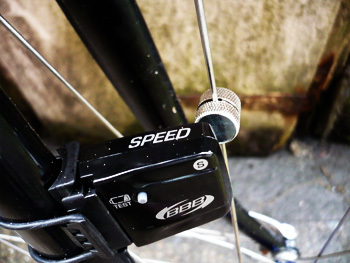 the sensor that says hello to the magnet once per revolution can also be fitted by bungee or zip-tie, preferably towards the top of the fork leg to enhance communication with the head unit. the battery for this arrived in a separate pack, easy to fit, and verification is by simple button press. there's an 's' marking on the sensor to encourage alignment with the magnet which clamps onto a front wheel spoke, either standard or aero being supported. then it's setup time, and that looks very scary. perhaps the worst aspect of any set of instructions these days is that they cover a large gamut of languages, presumably only one of which any of us are going to read. thus the size of the sheet of paper enclosed could probably also have served as media for a scale map of the united kingdom. or a 1:1 map of islay. in point of fact, setup took mere minutes, and even for the cyclist who would really rather ignore instruction manuals altogether, the step-by-step instructions were easily followed. so much so, in fact, that i made it to debbie's before lunchtime despite unpacking being a timely distance from breakfast. though the novelty will doubtless wear off in time, skipping through the different modes is a compulsive feature. 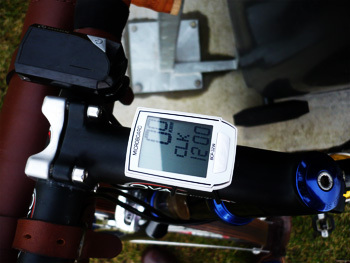 the speed at which i was struggling to travel was always clearly displayed at the top of a nicely sized screen, while lightly pressing a big button flicked through the lower display to reveal the time of day, distance travelled, ride time, average speed (very depressing), maximum speed, total distance and total riding time. 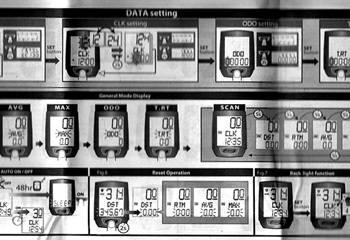 as if this were not enough, the microboard computer has a scan feature enabling it to automatically loop through all those settings all on its own. and presumably simply to add insult to injury, there's a speed pacer function to let you know whether the speed is above or below the average. now you know why i hate numbers. thankfully, given the preponderance of precipitation in this part of the world, the microboard is of waterproof construction, and will helpfully indicate when the battery level is not what it should be. it's available in a variety of colours should bike matching be seen as a necessity, and the build quality is fairly impressive. 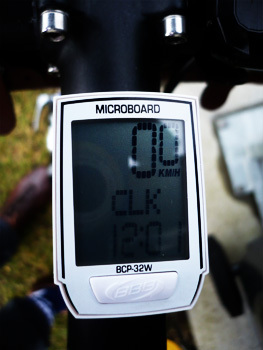 i won't be looking at my average speed too often, because that's even scarier than the instruction manual, but the distance display comes in handy, as do the ride time and speed functions. of course it does; that's why you'd buy it in the first place. and should you find it necessary to speed at night, there's a backlight function to keep you informed in the dark. i cannot offer that acceptance of the microboard has endeared me to numbers any more than was the case prior to it being affixed to the cielo, but perhaps through time and exposure to their familial greeting on each ride, my attitude will soften. at least it has no way of displaying power output; most of these computers do not feature algebra that will encompass negative numbers. 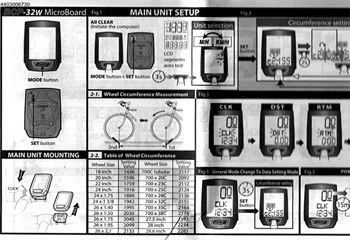 bbb offer quite a range of cycle computers, the microboard reviewed being pretty much at the top of the tree. cost is around £48, and for more information, contact the new uk distributors, windwave.